In 1880, Germany’s Pinscher-Schnauzer Klub (PSK) published its first Schnauzer Breed Standards Book which detailed all acceptable colorings for the breed including "white with black patches" (Parti-color). It appears that Schnauzers with white and black patches existed at that time, although not in large quantities, as this first book of breed standards did not name a single registered Schnauzer with this color pattern. Furthermore, the subject of patched/Parti dogs was not raised by Schnauzer enthusiasts until the 1930's. However on September 4, 1929, a litter of black miniature Schnauzers was born at the Abbagamba Kennel belonging to Countess v. Kanitz in Podangen (East Prussia), Germany. This litter included three black and white Partis (“schecken” in German) puppies. The parents of these puppies had demonstrably been purebred black for six generations. (It is very possible, although no one knows for certain whether there had been additional puppies in any of these prior six generations with similar coloring. These most likely would have been removed by the breeders). The Countess was certain that no "mis-alliance" had taken place - stating this fact bluntly on several occasions - and decided to take a chance breeding these Parti dogs. As a geneticist would have predicted, the pairing the siblings "Ilfis" and "Isluga" produced the three Parti puppies ("Moira," "Modiala," and "Medina,") . Another incestuous mating involving the dogs "Liara" and "Leander" from the second generation of Parti dogs once again produced six beautifully developed Parti puppies. 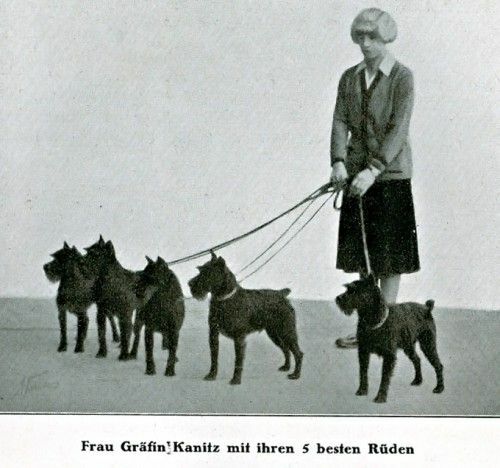 In 1929, Abbagamba Kennel’s litters of Schnauzers became the first Partis/Schecken dogs to be officially recognized and registered in Germany and for the next four years Parti Schnauzers were accepted and welcomed by the PSK. By the time of the Third Reich in 1933 however, the board members of the Pinscher-Schnauzer Klub decided to ban Parti Schnauzers from all future registrations and breeding. All Parti colors were being kicked out from the German PSK and breeders were no longer allowed to breed the Parti Schnauzers and were penalized if they did not follow the new rules of the breeder club. As a result, Parti-color Schnauzer puppies were destroyed by whatever method the breeder felt comfortable with – often drowning or stoning to death – all to avoid being kicked out of the PSK or being forced to pay high penalty fines. In response to the ban, a number of well-known cynologists and dog experts of that time petitioned the PSK at their general board meeting to reconsider its decision and asked for recognition of the Parti Schnauzers. including the Honorary PSK Chairman Joseph Berta, who in 1923 handed over his possition in the club to younger hands and veteran Richard Strebel kept the never previously encountered and seen Parti/Schecken color for "a lucky freak of nature" and argued for the re-recognition and permission for further breeding with this color stock. Although, Countess Kantiz Parti Schnauzers had been pure bred for three generations the PSK still rejected their request. 1. " [The] creation or emergence of patched/spotted dogs is contrary to the rules and is not yet scientifically proven." 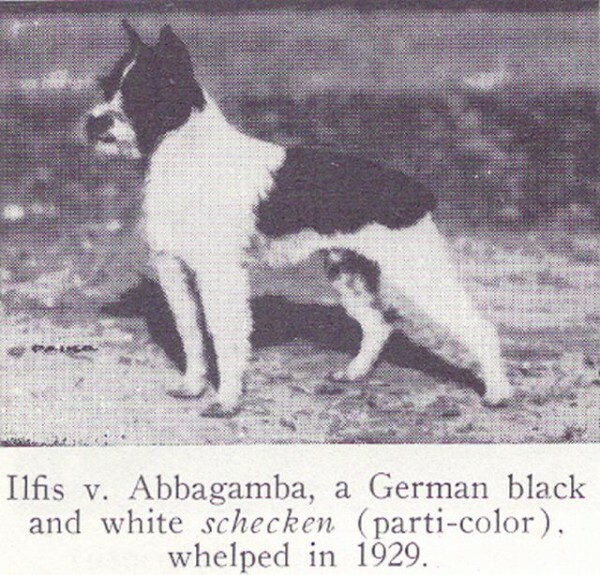 Although the Abbagamba Schnauzers were proof that pure breeding of Parti dogs was possible, limited or no information existed about DNA and GENETICS at that time and club members viewed this phenomenon with skepticism. 2. There was concern that Parti colored Schnauzers would be confused with the Wire Haired Fox Terrier. The Fox Terrier became popular in 1933 and board members of the German PSK stated that the appearance of the Parti Schaunzers and the Wired Haired Fox Terrier were too similar. They claimed this would create confusion in the public between the two breeds and would therefore have negative outcomes for the Miniature Schnauzer breed. In 1933, Germany was in the midst of a great economic depression which lasted from 1929-1935. 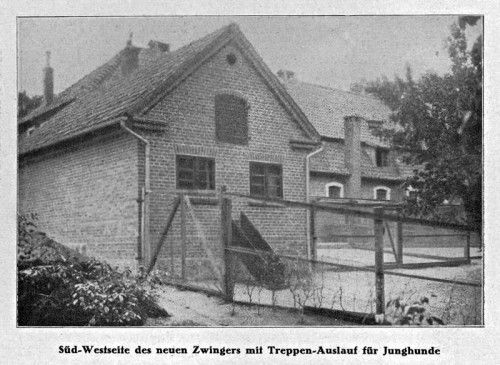 In many German villages during this time, the population of Salt/Pepper Schnauzers was higher than the human population and while the German miniature Schnauzer breeders were unable to sell their Salt/Pepper and Black Schnauzer puppies, while the new and trendy Wired Hair Fox Terriers from England were selling faster than they could be produced. Allowing the Parti-colored Miniature Schnauzers to remain in the PSK would only further hurt the sales of the many unsold Salt/Pepper and Black Schnauzers Puppies and its loyal club Members of the PSK. It was this fear of sales competition and the potential for economic ruin that was the true reason for the ban of Parti/Schecken Schnauzers. Realizing this ulterior motive, the Countess Kanitz of Abbagamba Kennel was rightfully outraged with the general meeting’s rejection of her request. She accused the board members of being undemocratic and communistic in their decision and considered their suggestion of breed confusion to be ridiculous and absurd. Schecken/Parti dogs had never been crossed with Fox Terriers and had always been 100% Schnauzer. 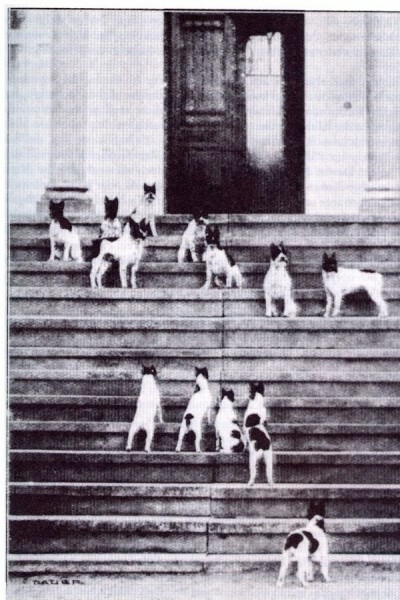 The Board of the German PSK placated Abbagamba Kennel with the promise to create a separate breed for the Parti Schnauzers in the future, but the onset of World War II put a halt to these plans. As of today, Parti Schnauzers are still discriminated against based solely on their color in Germany and in canine clubs around the world. 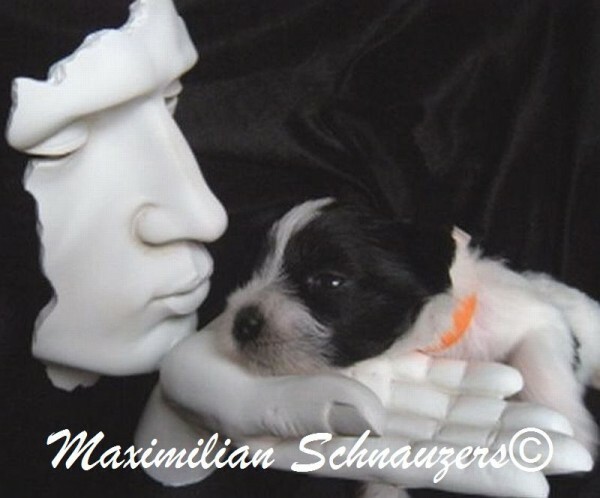 About Black to White Miniature Schnauzer Colors and Those In Between Colors! Litters of purebred black parents commonly produce puppies with white markings on the toe tips, at the chin, on the chest and at the tip of the tail. This is caused by the so-called "prenatal pigment stop. "These markings disappear in the first few weeks. However, this is often the beginning of the Parti pattern and if animals with these permanent white patches are mating with one another, the markings of the offspring will normally be significantly larger than those the parents have. The disposition for white patches is recessively inherited. Paired with an animal without this disposition, the Parti pattern does not appear because the disposition for full pigmentation dominates over the disposition for white patches. However, the disposition can be imparted invisibly from single-colored animals across several generations until one day - as luck would have it – a carrier of this genetic trait mates with a partner whose genetic material also contains this disposition. are pretty much non-existent here! Ironically, the US, Canadian, British and Australian Kennel Clubs decided to ignore German guidelines and establish their own criteria for judging the Miniature Schnauzer. For example, none of them regard the White Miniature Schnauzer as an acceptable color and in Britain, even Black and Silver is not accepted! Well, the Breed Standards were set by people, not God! A group of enthusiasts simply decided they liked this or that and thus "outlawed" any "off" color. Actually, while Pepper and Salt was quickly standardized, even Black, and Black and Silver were not readily accepted at first. However, though you can’t compete in the Show ring with dogs bearing other colors, many unofficial colors are still “allowable” in registered purebreds, and dogs of such colors can compete in other Kennel Club competitions such as agility and obedience. You’ll also occasionally hear mention of “Phantom” coloring, which (unofficially, of course!) describes dogs with very pale, almost white furnishings, of any of the following colors: Black and silver, Chocolate or Liver and Tan, or Black and Tan. Obviously, breeders breeding for the show ring do all they can to eradicate the non-official colors from their lines. This has led to an unfortunate attitude of “color-prejudice” against them within such circles. There's no such thing as a PURE-BRED "phantom" or "parti" or "liver" miniature schnauzer puppy. There are actually people who know so little about breeds that they think that a liver-colored schnauzer is pure-bred. Ummm...NOPE! They have been crossbred with another breed to get that color. While they are disqualified from the show ring, such dogs are still recognized as purebreds by the AKC (American Kennel Association). Where Did All These Colors Come From? Given the many breeds that were used to down-size the Standard Schnauzer to produce the first Miniatures, it’s not surprising that “non-official” colors have appeared in the breed. Indeed, varying shades of Liver or Chocolate were prominent in the early days of the breed. At least one dog from the first litter recorded in the Miniature Schnauzer studbook was “gelb” – German for yellow – i.e. a brown based dog with pale pigment deposition. 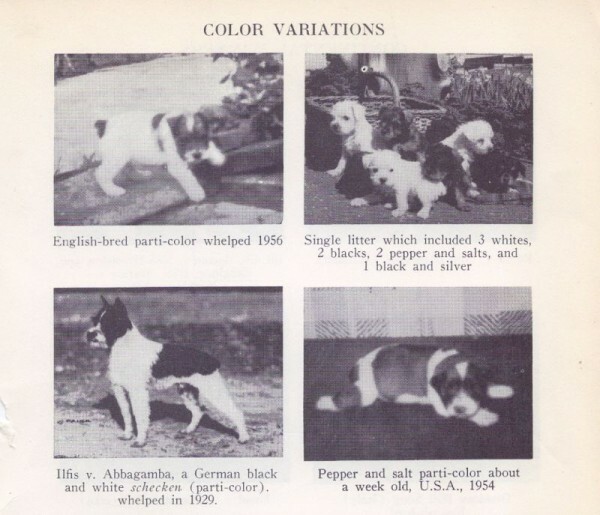 “Parti” colors too, commonly cropped up in these early litters, and were also recorded from a pair of black dogs belonging to the Abbagamba Kennel in Germany in 1929, and again from a mating of two Pepper and Salt dogs in the USA. So, while they can’t compete in the Show Ring, there is nothing wrong with the other colors as many like to argue. 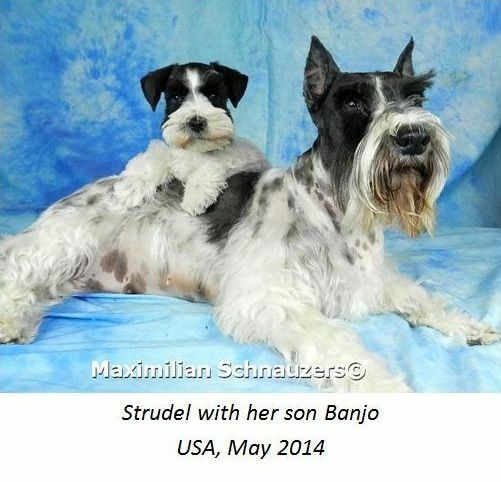 They are 100% purebred Schnauzer, and can be duly registered. Further, the Parti and other colors are extremely "old blood", found in most of the early lines. Miniature Schnauzers come in three basic colors genetically – either black (with a black skin) or liver (with a brown skin). Then there’s the true White Miniature Schnauzer which is genetically a dog with the color turned “off” so that it has white hair and pink skin. Banded coloring in the more common (and genetically dominant) black based dogs produces the Pepper and Salt and in the brown based dogs, the Liver Pepper. The Pepper and Salt has banded hairs in shades of gray to black with lighter silver furnishings on the eyebrows, beard, legs, and under the tail. This color can range from a very pale silver dog to a very dark nearly black dog. In the Liver Pepper the tones are identical but in shades of liver. One Color: The gene that codes for the “one color” appearance is dominant to the banded color. Schnauzers that are genetically one color are black if they are genetically black based, or liver if they are brown based. The Black Schnauzer is completely black, and has no banded hairs on it but may have a little white on the chest, for example (though this is not desirable in the Show Ring). And similarly the Liver is completely brown but can have some small white bits also. Because some Schnauzers also carry genes that code for fading- either all over or just in specific places - dogs that are genetically the same one color can appear quite different at maturity. At maturity a one-color brown based dog can appear so dark brown (liver) as to be almost black, or so pale as to appear almost white (wheaten). Bi Color: Bicolor expresses as Black and Silver in black skin dogs, and Liver and Tan in the browns. It is genetically recessive to the banded color. The Black and Silver Schnauzer has a black body coat and silver furnishings. The body coat will show no banding at all (or else it is actually a dark Pepper and Salt!). The same is true of the brown dogs, but in liver shades: solid liver body with tan to silver furnishings. Parti: “Parti” describes patches of any size or color on 'White'. There is a Parti version of all Schnauzer colors. The Parti gene is genetically recessive, so needs to be inherited from both parents to be expressed. There is quite a range of genetics that can result in White Miniature Schnauzers. However, the only pure White Miniature Schnauzers are genetically a “no color” dog having pink skin and no other coat coloring whatsoever. This is a recessive trait. Well, for a start, these colors do not exist in the Standard Schnauzer, from which the Miniature was developed in in the 1800s. Miniature Schnauzers can be either black based (with black skin, nose, pads and hair pigment) or brown based (with brown skin, nose, pads and hair pigment). Only the black based colors are recognized in the Show Ring – Salt and Pepper, Black, and Black and Silver. They can be any hue from very dark Liver to pale wheaten cream, or, if their color is masked, pure white (the so-called White Chocolate). All, however, will have brown skin, nose etc. This is, again, a recessive gene that codes for “broken color”. As such it can modify any of the other colors. While the White Schnauzer is officially recognized in its native Germany, White Miniature Schnauzers are accepted - but not considered desirable -under the Breed Standards of many other countries. Crazy but true! When it comes to the Miniature Schnauzer white ain’t white! That’s because there are several - genetically different – types of apparently White Mini Schnauzer. In this color schnauzer, white is masking over the real genetic color of the dog. When non-banded colors are masked by white, however, the only thing that is apparent is their base color i.e. whether they are brown (liver) – in which case their color is often described as “White Chocolate” - or the black based “True White”. They are simply one color dogs that have strong expression of the fading gene. So we can end up with white looking adult dogs that are actually technically Parti due to the characteristic patches of pigmented skin over pink skin.